"I think it will be transformative," explains Jayson Bowerman, with Bend Paddle Trial Alliance. He is talking excitedly about the proposed "whitewater park" adjacent to the Colorado Avenue Dam. "We have a lot of whitewater, but (Bend) hasn't been a destination spot." 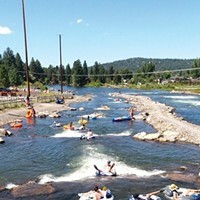 Part of a voter-approved bond measure, the so-called water park is scheduled to open as soon as next Memorial Day—and, in the process, potentially transform kayaking from an informal community in Bend to a full-fledged culture and add $1 million to the local economy. Ultimately, BPTA is responsible for raising $900,000 of the $7 million bill—and already has taken a healthy bite from that task, with $650,000 banked. The plan includes not only the waterways and rapids, but also terrestrial elements, like a new footbridge and pathways. It is believed that construction will begin in September, when water levels begin to recede slightly. The project will create a triage of sorts: One pathway will be an easy-going step-down series of pools to gently usher tubers past the Colorado Dam; on the other side, there will be a protected area to give fish a straight shot through; and in the middle, the highlight of the project: four engineered "waves," which will create an aquatic jungle gym for kayakers, surfers and paddleboarders. "Something for everyone has been the mission," says Bowerman. Engineers are completing the plans now, and Bowerman says one of the waves will be "inviting and open, where children can learn to gain foundational skills," while another will be "black diamond wave, big and fast." It will be the first such "park" on the west coast, although western states like Colorado and Idaho already host dozens, including in downtown Denver and Boise, which are reported to attract upward of $1 million in tourism revenue. By attracting more kayakers and by offering learning opportunities, Bowerman believes that the park can further develop the paddlers' culture in Central Oregon, which is currently less formal and expansive than the mountain bike and snowboarder/skier culture here. First racers are expected on the course around noon, Sat., June 28. The best spectating sites are at River Canyon Park, 61005 Snowbrush Dr. (off Brookswood). After-party: 4 pm – 8 pm, Sat., June 28. 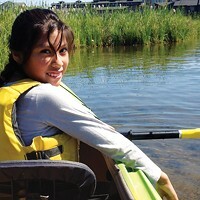 Tumalo Creek Kayak & Canoe, 805 SW Industrial Way.